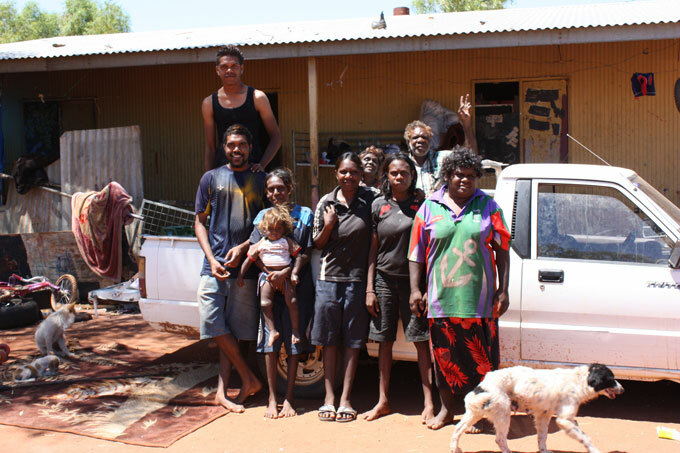 Photo above: Jeffrey Pepperill Kemarr and family at Camel Camp on the Utopia homelands, about 30 kms from Arlparra. Source: Amnesty International, Lucas Jordan. 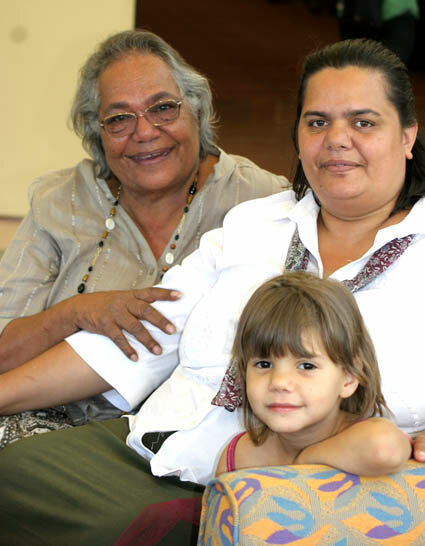 Below: Rosalie Kunoth-Monks, with daughter Ngarla and granddaughter Ruby, in 2006. From the Alice News archive. Human rights organisation Amnesty International has released what it calls a research report, focussed on the changes in government policy, particularly since the NT Intervention, that have affected the Utopia homelands. These are 16 small Aboriginal settlements dispersed across 3500 square kilometres either side of the mostly dry Sandover River, to the north-weast of Alice Springs. The central thrust of the report, titled The Lands Hold Us, is that government policy with respect to housing is denying the people of the homelands – around 1400 of them in the Utopia area – the right to their traditional lands. In the report this argument has two arms: one, that through leasing government is actually taking away land; and two, that through inadequate funding of new and refurbished housing government is taking away the possibility of people to live on the land. Nowhere in the report is there an acknowledgement that leasing only applies to a tiny fraction of Aboriginal lands, that is the land on which government is building and/or maintaining infrastructure. The fraction, in relation to the combined prescribed communities under the Intervention, was said to be 0.1% by architect of the Intervention, then Indigenous Affairs Minister Mal Brough. The Alice Springs News is not aware of a factual challenge to this figure, but as the leases only apply to townships or specific land portions within townships, whatever the figure, it is certainly tiny in proportion to the mass of Aboriginal-owned land. Nowhere in the report is there an acknowledgement that leasing does not change underlying title; the land remains Aborginal-owned, even if control over a tiny portion of it has been ceded for the duration of the leases to governments, as it is anywhere when governments invest public funds in the provision of infrastructure and services. On the contrary, sweeping statements about Aboriginal land being taken away from traditional owners are reported without qualification by Amnesty’s so-called team of professional researchers. Interestingly, they are not named and their qualifications for the research task are not stated. Photographers are given individual credit but authors not, apart from Rosalie-Kunoth Monks as author of the Foreword. As an activist Mrs Monks is entitled to rhetoric in her Foreword, and her depth of feeling and commitment to her people are not under question. However, when the report’s anonymous authors in the body of the report quote her and others on their perceived loss of control over their land without any attempt at balance, explanation or qualification they do mischief. These memorable, emotional declarations are used in the report as either overarching or concluding statements to its various sections that want to be seen as factually and rationally argued. It may be good rhetorical strategy but it does not make for useful, sober analysis, which is what the report wants its readers to think it provides. The report’s recommendations are so broad as to be meaningless. While elsewhere the report uses the term “available resources” (with the addition of the word “maximum”) and urges “budgetary prioritisation”, it does not consider any of its recommendations in relation to these factors. How much would it cost governments “fulfill”, as proposed in Recommendation 1, the rights of Aboriginal Peoples to their traditional lands? Is spreading around the resources available, as is implied by Recommendations 2 and 3, the answer? If not, how would priorities be established in relation to this? One of governments’ answers to prioritising policy implementation and spending has been the Growth Town policy, identifying towns and some town camps for a concerted effort with housing and infrastructure improvements. If these improvements are brought about, by not only government action and expenditure but also by changes that Aboriginal people themselves can initiate, then benefits may arise for people choosing to live on homelands and outstations. One of the ways that this could happen is through regional transport networks, linking homelands to growth towns and regional centres where services are or will be located. The NT Government has committed to this and has made some progress. The Amnesty report does not give it the least consideration. The report does present some evidence of the benefits for people of living on the Utopia homelands. For instance, it refers to medical research pointing to their relative good health, such as their impressive 40% lower adult mortality rates compared to other Aboriginal peoples in the NT. But when it comes to economic participation the case is fudged. The report says “some people on homelands remain dependent on welfare payments”. It does not attempt to quantify how many people on the dole. It says there are “opportunities for people to participate in the mainstream economy, while remaining on their homelands” and it names some: “Indigenous art, eco‐tourism, natural resource management or ‘caring for country’ programs”. Again, it does not attempt to quantify – how many people are involved in taking up these opportunities? Then it produces this extraordinary statement: “Homelands also form a central component of the Northern Territory tourism industry, contributing $775.78 million per year, some 5.8 per cent, to the Northern Territory economy”. To be fair, this is a direct quote from a research paper published by the ANU’s Centre for Aboriginal Economic Policy Research, headed up by frequent commentator on Aboriginal affairs, Jon Altman. The paper in turn sources its information to the Tourism NT website. Just in case readers are confused by the construction of the sentence, the dollar figure quoted has to be for the entire Territory-wide tourism industry. The Alice Springs News has not been able to find this figure on the Tourism NT site but there are figures of this order describing the size of the whole industry. Neither have we been able to find a dollar figure to match the contribution of people on homelands, nor a description of homelands as central to the industry. Research on Indigenous Cultural Tourism that is on the site, using figures relevant to the period from 2006-07 to 2008-09, shows international “cultural visitors” as rating highly visiting an Aboriginal site or community – 27% favour doing this. “Cultural visitors” make up 72% of all international visitors to the NT. However, roughly twice as many visitors to the NT are domestic, and of them only 13.2% are “cultural visitors” and in turn only 6.8% of that group are reported as favouring a visit to an Aboriginal site or community. This data helps put into perspective the claim for homelands as being “central”. Who could quarrel with it as an aspiration but achieving it will not be helped by a lack of realism about the current situation. For example, tourists are not allowed to go to most homelands without a permit. The report’s discussion of NT Intervention is focussed on the Intervention’s alleged removal of Aboriginal peoples’ rights. Like many Intervention critics before them, the authors’ approach to rights is broad-brush. There is no consideration given to those aspects of the Intervention that have attempted to protect the rights of the vulnerable, such as children. The report’s emphasis on the overriding importance of consultation and consent – Recommendation 5 – pays no heed to the potential voicelessness of children, and possibly others, in such scenarios. On the question of having a voice, the report is critical of the NT local government reform that scrapped small Aboriginal community councils, replacing them with shires (“mega-shires” in the language of the report). Once again, the report fudges on this issue. It gives no account of the local boards that feed local issues through to councillors, and thus loses the opportunity to look at instances of their effectiveness or lack thereof. It deplores a loss of representation in the Utopia homelands, but does not acknowledge that their number one advocate, Rosalie Kunoth-Monks, is the president of the Barkly Shire. It is critical of the way the shires have brought together “a wide variety of regional and disparate interests from pastoral, mining, Indigenous and non‐Indigenous town‐based and remote representatives on shire boards”, without even being prepared to consider the way that this might present opportunities for the peoples of the homelands. The report also does not acknowledge that Aboriginal people have a majority on the Barkly Shire Council, a majority that is in proportion to the 70% Aboriginal demographic . Would acknowledging this be unstrategic, detracting from the victim status assigned to Aboriginal peoples in their arguments? The report’s final recommendation, number 6, is that governments take into account the previous five when it comes to renegotiating the 2007 Memorandum of Understanding on Indigenous Housing, Accommodation and Related Services, which will expire next year, together with the SIHIP. The “renegotiation” will presumably happen in the wake of the current “Stronger Futures” consultations being conducted by the Commonwealth. The amorphousness of Amnesty’s ambit claim on the issues is hardly helpful. There may well be achievable steps that could be taken to support the development of a viable future for the peoples of the Utopia homelands but they are hard to discover in Amnesty International’s report. Very informative article Kieran. Much to think about. Thank you. PS. Did you see Bob Durnan’s article reecntly on the ABC website ‘The Drum’? for these people who were virtual slaves on their own land, uhh. wet winters. There was no school + no health clinic. municipal services at all, never mind a road or any homes to live in? Certainly many complain the Northern Territory Government and Commonwealth may NOT provide public funds to build more houses for these Land Trust corporate landlords. But why are public money grants required by these Land Trust corporate landlords? Same Land Trust corporate landlords have reasonable incomes, royalties, and rents, why not use their own funds? Why does the Commonwealth continue to exempt these wealthy Land Trust corporate landlords from our usual tenancy requirements like issuing tenants valid leases and maintaining tenants houses? Such does not help their tenants. The Central Land Council acting for these Land Trust corporate landlords claims “Traditional Owners” possess no right to leases for their homes, no right for their family to live with them, no right for friends or tradespersons to visit them in their homes, no right to run a business, and reminds us that any “Traditional Owner” can terminate any permissions granted immediately whenever such whims are felt. The Central Land Council claims “Traditional Owners” seeking these otherwise basic human rights must obtain leases from the Land Trust corporate landlords. In practice the Central Land Council and the Land Trust corporate landlords refuse to issue leases. For over 20 years our segregated family – several belatedly acknowledged as “Traditional Owners” – has been required to seek, so sought and been denied leases. Still not seen one in draft form. The Commonwealth granted temporary leases to itself – as they were essential – yet refuses to issue the tenants with sub-leases. Commonwealth now wants Northern Territory Government to manage them, perhaps pay for them. Where are the draft leases for these houses on communities ? Northern Territory Government needs to publish these draft leases, make them available, easy to find, so as to promote public discussion. It is clear the Central Land Council and these Land Trust corporate landlords dislike leases. Leases provide all parties with enforceable rights and responsibilities. Seems the Land Trust corporate landowners prefer to be exempted from having to care for their tenants houses – and be accountable in court! With the best will in the world, there is a limit to what Governments can do with the funds at their disposal. If priority is to be given to education, and especially primary education, in the planning of, and hoped for, future participation in the national story, children must come together in schools. It follows that those schools must be of a certain size and centrally located. This rules out a school in every scattered and marginally populated outstation. No land will be being taken away, but some will be leased to allow a degree of centralised development. To suggest theft of land and the herding of people by the army onto reservations is rhetorical grandstanding. It’s simply not true. Any careful consideration of what is suggested by that assertion of herding would have to conclude that the only organisation with a vested interest in keeping indigenous homelands and their residents isolated from the rest of Australia would be the large land councils. We read of moves in the Top End to break the monopoly of the Northern Land Council. If only Mrs. Kunoth-Monks and others would take a similar broom to the Central Land Council! The death of a people and a culture will come about, and to an extent has already begun, by hiding one’s head in outstation sand, denying the centrality of education, and pretending that tomorrow will be just like yesterday. All that will come from such denial is another generation left on the outside looking in, relegated to a life of confused frustration, and supported by charity.